It used to be, the cook in the house planned meals based on church cookbooks and family recipes. At least it was when and where I grew up (as if I’m finished growing up). Usually Mom, sometimes Dad, did their best to plan dinners in advance, on a piece of paper, feeding themselves and three little girls familiar, homemade food almost every night. Sure, there was sometimes frozen (never delivery) pizza, or Arby’s, in a pinch or for a treat, but more often it was dishes that I clearly look back upon fondly, given the frequency with which I’m recreating them for a healthier lifestyle: tacos, tuna hot dish, Italian dunkers, tuna melts, broccoli-cheddar-rice bake, grilled cheese. Oh, and then this turkey-gravy-toast thing, whose glory I was trying to explain to Steve the other night, but he and you will just have to wait for its food blog reincarnation. Because how do you explain that soggy toast can actually be delicious in a form other than stuffing and involving a pizza cutter? Times aren’t so simple these days. Now we have Pinterest, and more online and print food publications than one can count. Even fashion and design blogs understand that they must occasionally post a recipe because it could be worth thousands of new page views. We’re deemed underachievers if we plan dinners for the week based on our own repertoire, without trying something new that we’ve pinned or letting some meal delivery service trick us into thinking we’re restaurant chefs. However you get there, even if it’s Blue Apron, I sincerely support everyone cooking at home, but it’s just gotten so overwhelming. I’m starting the year with some very lofty goals for the blog, because I want to help you simplify healthy, comforting, homemade meals in this crazy food culture. From an observer’s perspective, it might seem like I have the perfect setup to get after these goals. New house, beautifully lit kitchen, working from home, usually unrestricted grocery budget, a husband who will eat vegetarian. But let’s be real: goals are never as easy as they look. Who you are and your circumstances are no match for the difficulty of big goals. If it’s not money it’s time, if it’s not time it’s something else (but it’s probably money or time). Fill in your obstacle. I’ve found myself wallowing about starting the year behind, because I’m a careful planner (i.e., a slow perfectionist), because I have a house to clean, because I have a puppy to walk every two hours, because I chose to have two glasses of wine last night. It’s not a positive way to live, but it’s often hard for me, the end-oriented individual, to sit back and enjoy the process. Aside from my frequent “meetings” with Adriene on the mat, I’m thankful to have been refocused this week, even if it comes and goes. The morning of photography day, I got word of a friend in need, so, instead of a stove, camera, and computer, I’ve been lucky enough to spend a little of my week playing with babies and torturing Clarence with the smell of bacon, in the name of a freezer-friendly delivery of mac and cheese (and yes, if you guys are reading, that was gluten free). My perspective got bumped from “I don’t have enough hours in the day!” to “How lucky am I to have a flexible schedule? ?” So lucky. For once, I stopped worrying over photography that would get done less than 24 hours later and got with the moment. 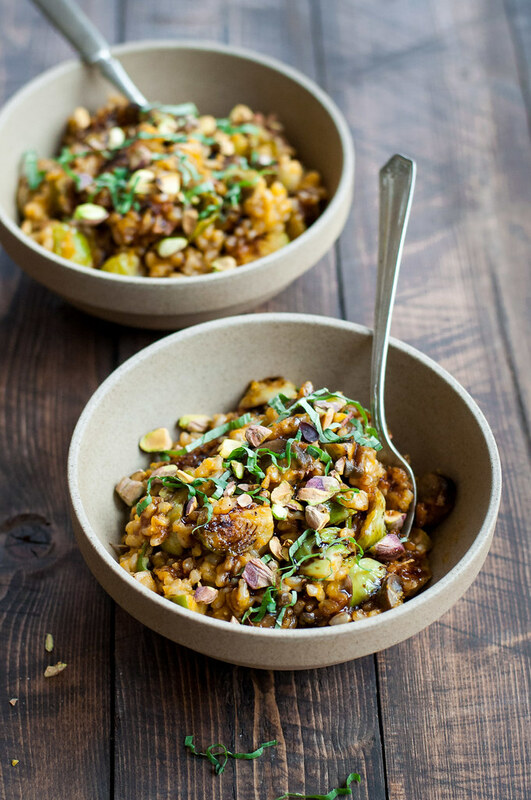 Before heading off to visit the cutest babies ever, I snuck in the pictures for this oven-baked balsamic and brussels sprouts rice bake with mushrooms, a dose of sneaky shredded squash, syrupy reduced balsamic, and a handful of smoky, salty toasted pistachios (which, btw, I shelled by hand). It’s a dish that would deliver well to a friend in need of dinner, or grace your Valentine’s table for two, right in your own dining room. Actually, the inspiration for this rice bake came from a combination of all the components of Valentine’s Day dinner 2014 for me. I worked a little too long in the kitchen to serve mushroom rice with stuffed scallops, plus separate sides of brussels sprouts and roasted balsamic squash. The flavors worked so well together, that in brainstorming for good Valentine’s blog recipes (which can, of course, be made on any other winter night), I thought to just smoosh them all together into none other than my favorite dinner vehicle: the hot dish/casserole/gratin. 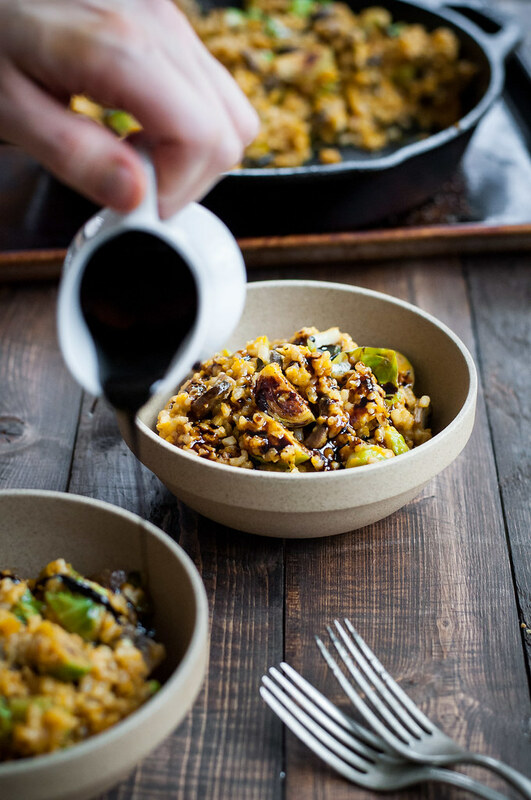 You could easily make the whole skillet, along with the balsamic reduction, in advance. Just leave it in the pan and pop it in the fridge after it’s cooled. Then, as you’re getting started with date night in (like during the cheese), pull the rice bake out of the fridge, let it come up to room temp for an hour or so, and warm it in the oven around 325 until it’s heated to your liking. The balsamic reduction keeps best at room temperature, so don’t worry about losing a little jar of it in the depths of your fridge. 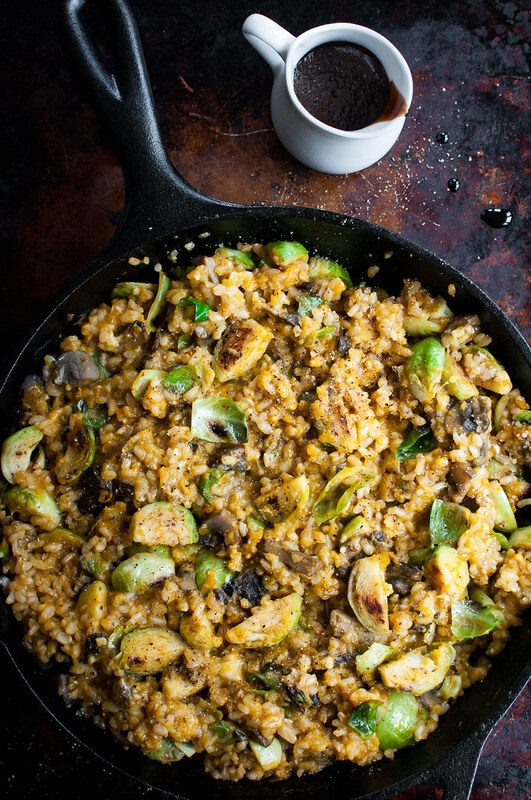 The best part is that this skillet rice bake is a complete meal: veggies, faux meat (mushrooms), and rice. It’s not too heavy that it’s ruined by an appetizer, and if you want to take it up just a notch you could serve it alongside some buttery garlic bread. And of course, your beverage of choice. Or of your sweetheart’s choice. Since I’ve tested this recipe about three times and Steve is not about making it four on Valentine’s Day, our evening at home will consist of a good ol’ throwback menu. Not surprising, coming from me, the retro dinner lover. Tuna hot dish (replacing the tuna with white beans–sacrilege! ), buttered peas with onion, and a top secret dessert recipe in the works for a future blog post. Don’t worry, it is most definitely chocolate. I’ve also been strangely craving sweets, so I may or may not stop at CVS on the way to pick up the pup today and stock up on everyone’s favorite Lindor truffles. So romantic. Gluten free/meatless. 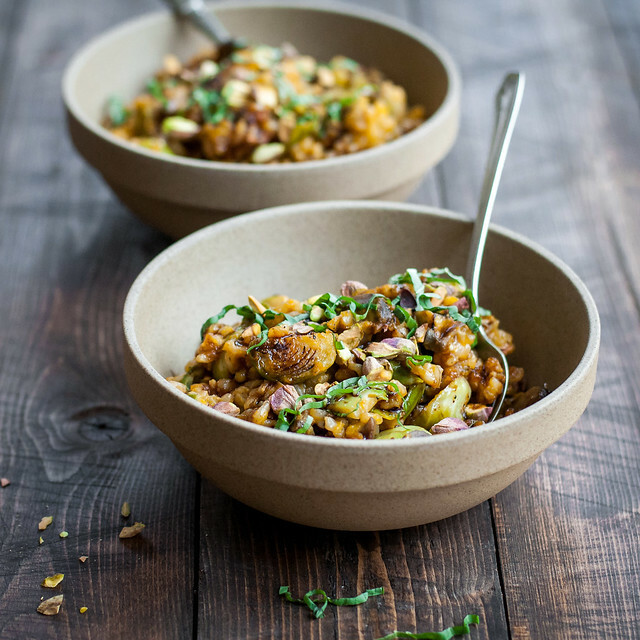 A risotto-like rice bake with sauteed mushrooms and winter squash grated and snuck in, for extra vegetables. 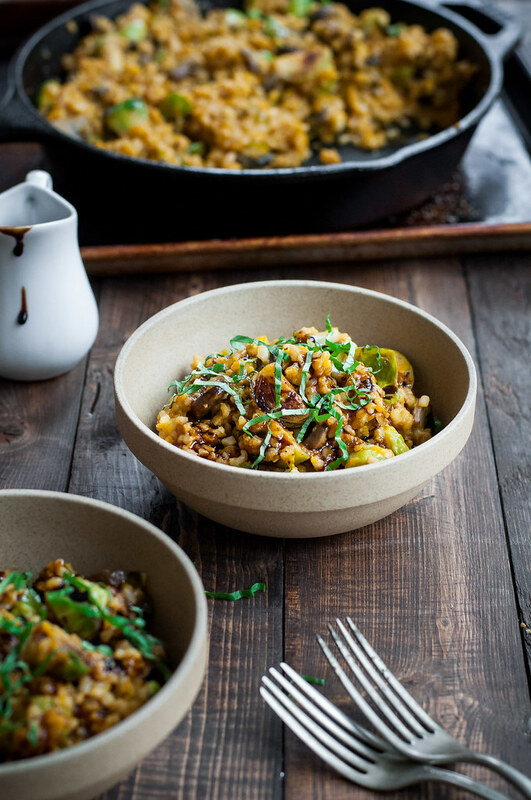 Make this gluten free, one pot meal ahead and enjoy it for a special night at home, without extra work. Preheat oven to 350 (F). Melt 1 tablespoon each butter and olive oil in a 10 inch cast iron or other oven safe skillet over barely medium high heat until foaming. 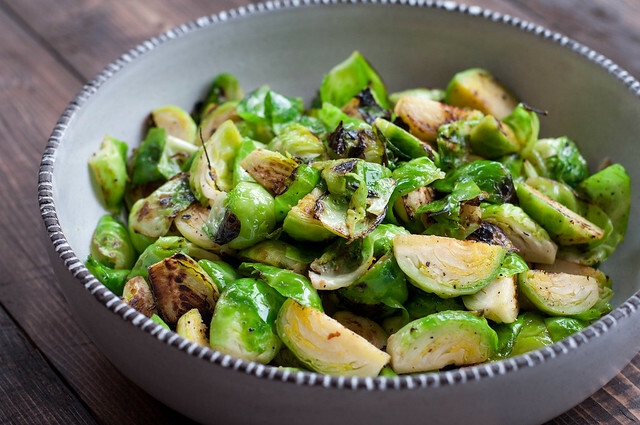 Add brussels sprouts and cook until browned and tender, about 5 minutes. Season with ½ teaspoon salt and pepper to taste and remove to a bowl. In the same skillet, heat a tablespoon of olive oil over medium heat. Cook mushrooms and shallot until just tender and with some liquid still in the pan, about 5 minutes. Add minced garlic and cook another minute. Add rice and squash and stir, then cook for a couple minutes, until almost all liquid is evaporated. Pour stock into the skillet, raise heat, and boil for two minutes, then remove from heat. Cover and carefully transfer to the preheated oven (I put the skillet on a sheet pan). Bake until rice is just tender, about 40 minutes. Remove from oven, stir in reserved sprouts, cover, and bake 5 more minutes. 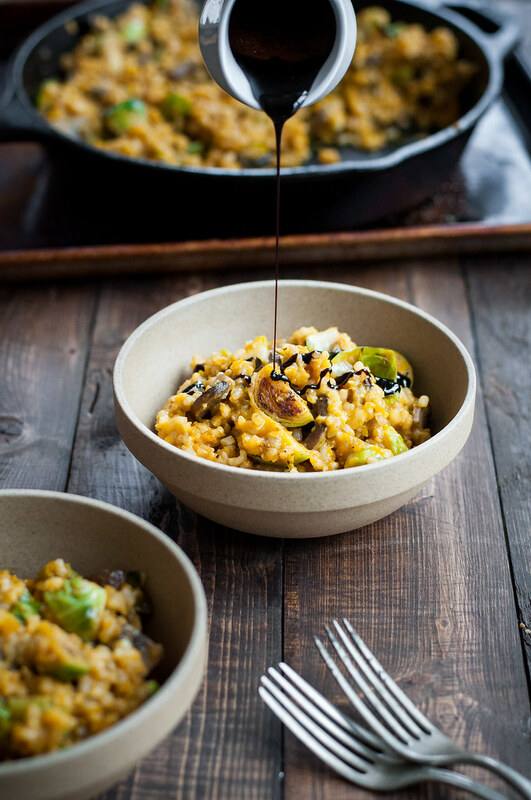 While rice bakes, heat the balsamic vinegar in a small saucepan over medium heat with a clove of crushed garlic until it boils gently. Reduce heat and simmer gently until thickened but pourable, about 20 minutes. Store any leftover balsamic reduction at room temperature or it will harden in the fridge. Let rice bake stand, covered, for 10 minutes after removing from the oven, then stir in parmesan and 2 tablespoons butter, cut into pieces, plus salt and pepper to taste. Serve in bowls drizzled with balsamic reduction and finished with extra parmesan, black pepper, toasted nuts, and fresh basil. It's best to use a less expensive balsamic when reducing it yourself. Higher quality (usually more expensive) balsamic vinegar is already more concentrated and will likely be difficult to reduce without any added benefit to the flavor. Note: This page contains affiliate links to products on Amazon that will make cooking this recipe oh-so-enjoyable. There’s no extra cost to you for using the links to shop for these products and all your other Amazon needs, and you support NCK in the process. Thank you! That looks disgusting. Also, no one is going to read that rambly mess of a post. Why would you think anyone cares about your pathetic life? If you’re unfamiliar with the land of food blogs, most of us are here to share our nasty recipes and the details of our pathetic lives, almost every day. It’s a form of self-expression and a love for cooking that drives me, and I’m lucky that many do take interest. You’re welcome to your opinions, but please refrain from profanity in comments–it will be edited at my discretion. This dish looks absolutely beautiful! All of those vibrant colors and full of so many healthy ingredients. Thanks for sharing such a delicious post! Your recipe makes my taste buds tingle. 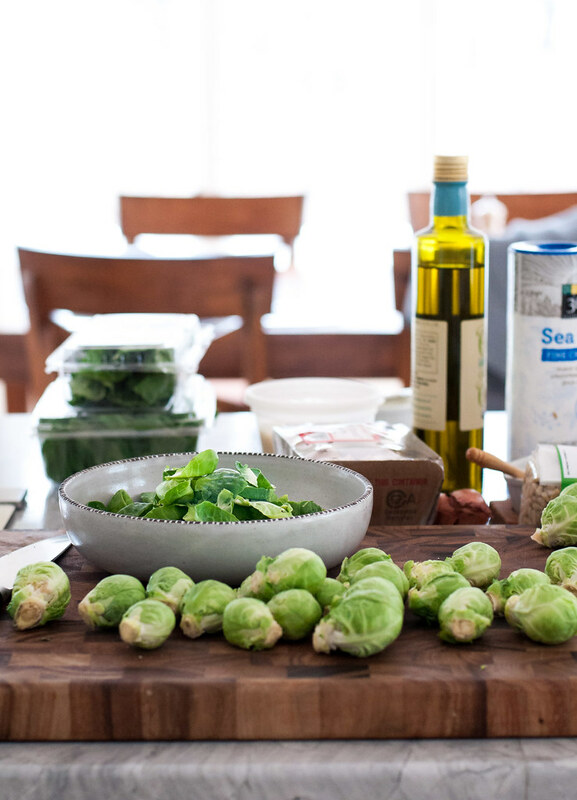 I don’t know if I could wait to eat the Brussels sprouts after sauteing them in the butter, but I would have to exercise deep restraint because your finished dish looks marvelous, and your photographs are gorgeous. Thanks for sharing this. Kathryn, I didn’t even mention that, but I might have plucked a few while I waited. 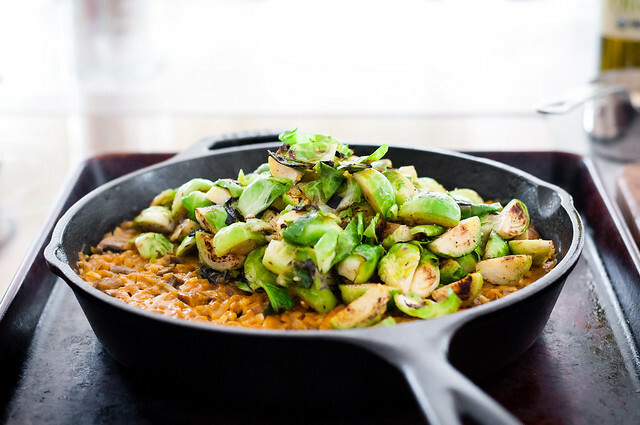 The green in that brussels pic is barely edited–they aren’t as crisp on the outside as some restaurant versions I’ve had, but for an at-home solution, I LOVE the result. Thanks for the comment! This recipe was an absolute delight! Everything about it tantalized my taste-buds. As a nutritionist I love that you used a mixture of butter and olive oil rather than straight butter, and packed in so many nutritious veggies. My favorite part is the addition of toasted nuts, Parmesan, balsamic drizzle, and fresh basil at the end…. muy delicioso! Thank you so much for sharing. This looks amaaaazing but I am working on cutting down on grains! Do you think this could be made with quinoa instead of the brown rice? Heather, sorry for the late response! I think it would taste great with quinoa. However, the two have quite different cookings times and can require different ratios of liquid to cook properly, so it might need some tweaking. To start, I would keep quantities the same and reduce the cook time to around 15 minutes in the oven. Let me know how it goes! We are almost finished vacationing and I just happen to have the ingredients except squash in the refrigerator. Thank goodness I don’t have to waste the food by throwing it out. Looks delicious. Thanks Patsy! Hope you liked it. Could this be made ahead of time? Looks great. I think the sprouts would get a bit soft, but if you’re not going for stellar presentation it definitely does okay made ahead or as leftovers!